New and Improved Look!!! What do you think? I feel spiritually poor a lot of times and this was a wake up call to me as well. In America we have been blessed in so many ways and yet many of us are poor...poor in the area that matters the most. True richness is found in Jesus Christ and in him alone! This is a post from Without Wax blogging from India with Compassion. "This morning before we left for a day of visiting Compassion projects I read this verse during my quiet time. In the midst of everything I’ve been blessed with I’ve started to live with a delusional sense of self-sufficiency. Somehow, I’ve missed what this 7 year-old boy could fully grasp. This is the day. This is the day I should rejoice in Him. Not because my relationships are going well. Not because I’m enjoying a season of success. Not because I have a secure job. Because, this is the day. This day. With all of it’s potential troubles and unexpected crisis and interruptions is the day for me to be spiritually rich. You and I can do a lot to change the lives of these kids (and I believe we should), but we could never replace the richness they’re finding in Christ. Just one more reason I’m such a fan of what Compassion and so many other great organizations are doing to take a bright light into a dark world. Anyone else need a reminder that “This is the Day”? So a few months ago we had dinner with Jeff and Abby and Ross and Erin and I am just now posting pics ....look at all those kids. We had a great time!!!! Thanks Abby for being so brave! 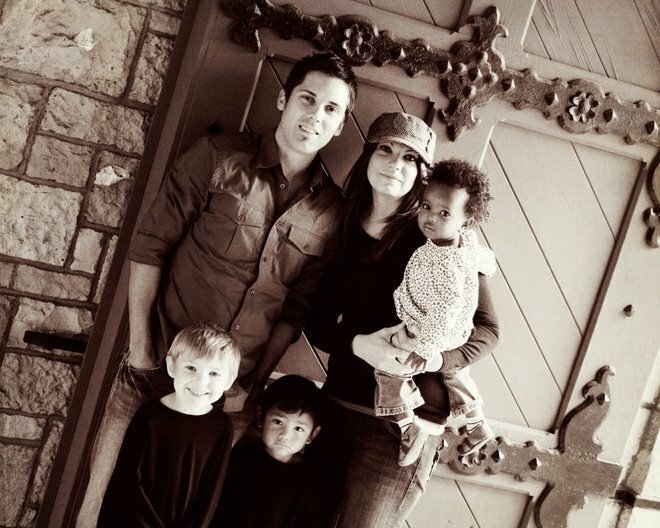 This is our social worker Jennifer, she helped bring two of our three kids home and has been a part of our lives since Isaac was six months old.....she is our social worker but has also became our friend....We Love You Jennifer....Thanks for all you did in the process of our adoptions. the building with a metal roof. 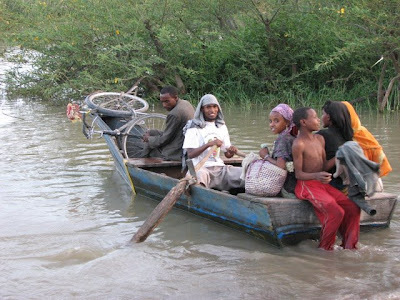 Ziway for trading, to attend school, to grind grain, for medical care, etc. 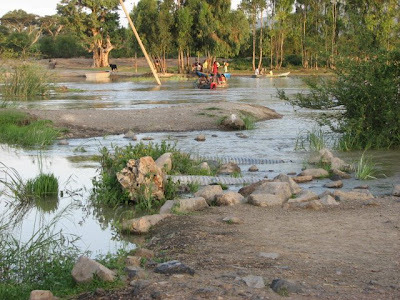 Ziway Meserete Kristos Church (MKC) wants to build a bridge over the river. a small clinic, and churches in the area of Bochessa. the people of this area. 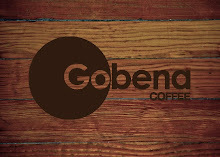 ﻿Your continued support in Gobena Coffee is helping to make this possible....Thank You!!!!! ! 100% of the profits are being used to help those in need. A Looooong time ago a friend wanted to see our concrete counter tops......so friend here you go!! Look at my Little Dinker!!!!! And Look at her Now!!!!!! She has grown so much and has quit the little personality....we call her our little Eva Diva! 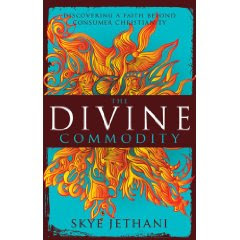 I am currently reading this book...so far so good! Have any of you read it.....if so what did you think? Good Friday 2009 - Ending from buckheadchurch on Vimeo. We went to the Creation Museum a few weeks ago and the boy's LOVED it.......They LOVE Dinosaurs!! I am a night owl that wants to be a morning person.....so how to make that work, i don't know? What time do you go to bed and rise and shine? We went to Turkey Run on Sat. for a family hike.....it was a blast!!!! I LOVE walking in Gods nature....i used to go here when I was a kid, so it was fun to be able to have my kids experience it as well and they Loved it. Anyone want to join us next time? Some of you know that Gobena Coffee partnered with Lifesong for Orphans on a project in Ethiopia....we are very excited about this and are planing a vision trip to Ethiopia in July. None of this would be possible without YOU the Gobena Coffee drinkers....Thank you for continued support in Gobena Coffee. 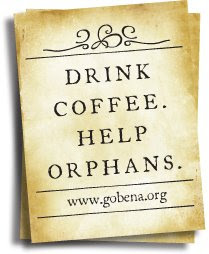 Every time you buy Gobena you are a helping hand in the worlds orphan crisis. Shortly you will be receiving a brochure with your coffee that will explain a few things and talk more about our projects...we would LOVE it if you would continue to spread the word about Gobena. Again 100% of the profits go directly to help orphans....100%!!!! Steve and I are going to the Orphan Summit this year. Gobena Coffee is serving the conference......so if you want to learn more about Orphan care and experience AWESOME coffee going to an AWESOME cause then come join us. Could anyone tell me the name of the first song in this video and where i could find it ? "Your life is to be lived in such a way as to reflect Him, to show the world the character of God- His love, His peace, His mercy, His gentleness. You are to live for Him, to accomplish His will. To miss this purpose is to miss fulfillment. It is to have existed rather than to have lived."